I love to cook and love being in the kitchen. However, I will admit that I am a messy cook. My clothes always seem to get stained and dirty while I am making my "creations". I have been known to wear old clothes, which isn't convenient at all when company is soon to be arriving. Recently all this changed when I discovered Flirty Aprons and their line of beautiful aprons for both adults (men & women) and children. Of course I had to give them a try and have never looked back to the days of wearing old clothes to cook in. Are you tired of that boring plain apron that shows no personality ? If you answered yes, I have the apron for you ! 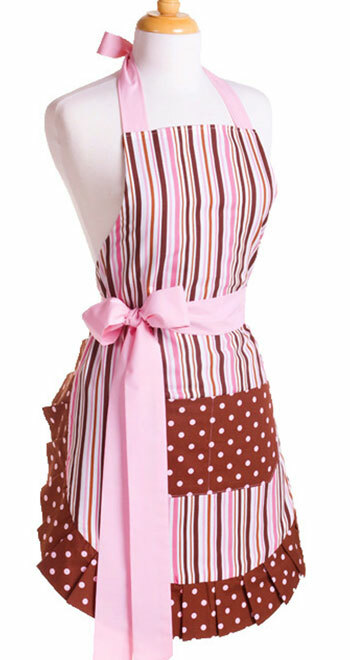 The apron that I tried is the Original Pink Chocolate apron. I hav e received tons of compliments on this apron when guests have either seen it on me, or hanging in it's special place in the kitchen. I am short any everything always seems to long for me but this apron falls a few inches above my knees, which for me is great. I really like the pockets on the front which allow you to keep things handy! About the company: Flirty Aprons was founded by two married couples: Joseph and Heather Hansen, and Spencer and Jamie Taylor. When the owners initially met they discovered they each had a strong passion for business. They knew that their partnership would be enriched with a variety of skills that would allow them to create a successful and enjoyable business. With Mothers Day & Father Day around the corner, these fun aprons would make a great gift!! You have more than enough time since they offer Same Day Shipping. Place your order by 2pm EST and they will ship your apron out the same day. Orders after 2pm EST will be shipped the next business day. NOW THAT IS FAST ! 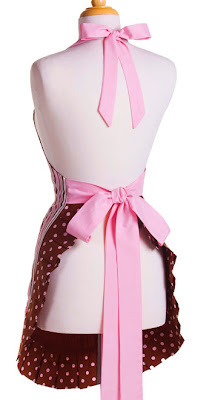 An apron from Flirty Aprons! 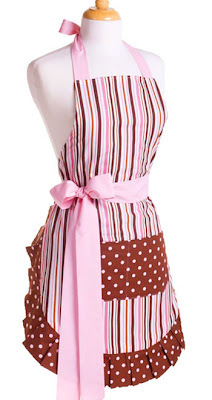 Visit Flirty Aprons and leave a comment letting us know what apron catches your eye! One winner will be chosen ! I will be using a random number generator to select the winner. Contest ends at 11:59pm CST on 4/20/10. If the prize is not claimed in 48 hours a new winner will be chosen.Contest open to U.S. residents only. I love the Frosted Cupcake apron! I'm a Twitter follower and Tweeted! I like the Women's Apron Original Sweet Sunshine. I love the Sassy Black. My favorite is the Woman's Apron Original Chic Pink. I like the sassy black. LOVE LOVE LOVE the pink chocolate!!! I love the one with sunflowers! I am sooooo wanting that Red Scalloped Apron! I like the Women's Apron Original Sassy Black. I love the Scalloped Sassy Red apron the best. THanks! I'm a follower on google friend! I love the original sweet sunshine! I like the chic pink apron. Thanks for the chance. Original Blue Chocolate is sooo cute I dont cook much but maybe would start if I had a cute apron to wear. I like the Sassy Black apron. 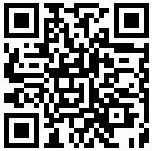 Following your blog now as well! I am now a fan on Facebook as well... and I retweeted your info on your giveaway! Here's to hoping I win... your aprons are excellent! I really like the Scalloped Saucy Safari. The Blue Chocolate Apron is my favorite! Chic Pink! CUTEST APRON EVER! I really like the orginal Pink Chic apron. I would love to have one. I like the Blue Chocolate apron. My fave is the Women's Apron Scalloped Cherry Blossom! Beautiful! Thanks! I follow thru GFC! Thanks! I love the original chic pink. I love the Woman's Apron Original Frosted Cupcake, thanks for the chance! I love the Scalloped Chic Teal apron! I would love to have the chic teal apron, very cute. I love the chic pink! I love the original sassy black. Woman's Apron Original Frosted Cupcake caught my eye. Pink chocolate or cherry blossom! I love the Original Scarlet Blossom apron! I’m a Facebook Fan Jennifer G.